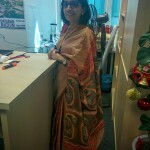 My MIL dutifully wraps her sarees in a soft mulmul cloth or a dupatta or in this case, an old saree to store them. 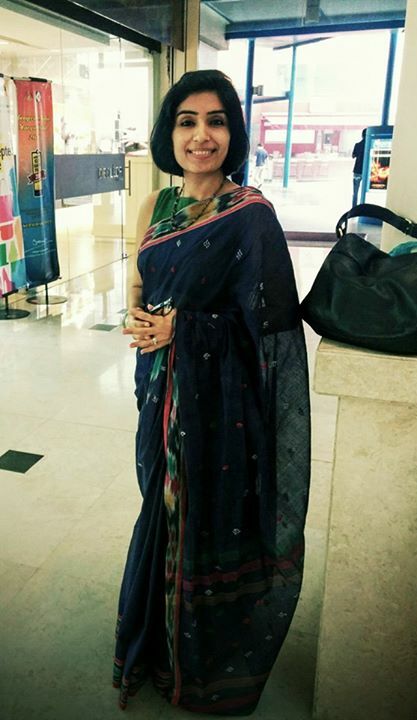 Last year when she gave me a a few of her vintage gems, she may have wrapped them in the saree I’m wearing today. A few days back, when I was choosing sarees to wear over Diwali, I found this lovely, dark blue handloom saree with a patola border and small geometric bootis in the body, being wrapped around my silks. I quickly got it ironed and decided to give it back it’s lost glory and pull it out of the dark shadows of the suitcase. very lovely black with a beautiful border.